Synopsis: Blue Box Special Edition #26: Astricon 2007 presentation - "Hacking and Attacking VoIP Systems: What you need to worry about"
Welcome to Blue Box: The VoIP Security Podcast Special Edition #26, a 55-minute podcast from Dan York and Jonathan Zar covering VoIP security news, comments and opinions. Production assistance on this Special Edition was provided by Michael Graves who had a very tough task given the poor quality of the recording that I gave to him! Kudos to Michael for getting it to sound as good as it does. Welcome to Blue Box: The VoIP Security Podcast #82, a 47-minute podcast from Dan York and Jonathan Zar covering VoIP security news, comments and opinions. Download the show here (MP3, 21MB) or subscribe to the RSS feed to download the show automatically. NOTE: This show was originally recorded on June 21, 2008. Note about the production team – new special editions coming soon. Welcome to Blue Box: The VoIP Security Podcast #80, a 44-minute podcast from Dan York and Jonathan Zar covering VoIP security news, comments and opinions. NOTE: This show was originally recorded on April 17, 2008. Network World: Government agencies rejecting VoIP? ZDNet: Attacks escalate on critical U.S. government networks: Will a Manhattan Project work? 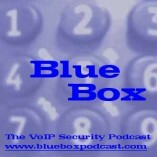 Welcome to Blue Box: The VoIP Security Podcast #78, a 32-minute podcast from Dan York and Jonathan Zar covering VoIP security news, comments and opinions. Download the show here (MP3, 15MB) or subscribe to the RSS feed to download the show automatically. Dan met with Craig Bowser down at VoiceCon, also David Endler, Mark Collier, etc. Jonathan met with Dean Elwood, Martyn Davies, etc.